Paramount just revealed the first ever footage from Michael Bay's live-action Teenage Mutant Ninja Turtles movie. We've seen the Turtles in action — and they look like GIGANTIC GREEN BABIES. The best way to describe the look of the new Teenage Mutant Ninja Turtles is giant, galumping, green babies. Like the baby masks that costume shops sell on Halloween, only as turtles. Similar to these babies below — but with Voldemort's nose and very, very childlike eyes. It's very jarring, but kind of what we expected. However, the turtles are MUCH bigger than we ever suspected. They are absolutely giant, and when they land they make a huge thud noise. They are simply massive. Their skin looked very smooth, similar to how we've seen them before. It's a weird cross of baby face, monster nose, green skin and all tied together by something vaguely phallic. I'm not saying that they're good or bad. I don't know yet, because it was such a short glimpse. It was definitely weird, at first sight. But the one important note is that the toys do NOT reflect the sheer magnitude of these creatures. Moving on to the actual meat of the trailer, it starts with William Fichtner (who plays Shredder) giving a gravely voice over and a God's-eye view of (what I'm presuming is) New York City at night. "Crime, violence and fear have run rampant. Our great state is being destroyed. People want justice restored.... people want heroes, Ms. O'Neil." Which means he's talking to Megan Fox's character O'Neil. Cut to shots of the sewers and members of the Foot Clan storming the sewers and running about on the streets. Note: The Foot have an interesting new look, the purple hood has been replaced with a shiny (ish) mask over the cloth hood. It's like a mask on top of a mask. The quick cuts in the sewer continue, and then you realize that April O'Neil is trying to record some sort of ninja happenings in a dark sewer with her iphone. Always the reporter, that April. Ficthner's voice over continues, "Heroes are not born, they're created... That was what your father and I were trying to do. Create heroes." WHAAAAAAT that means April O'Neil's father helped Shredder to create the Turtles which, WHAAAAT!!!!" Cut to a shot of a laboratory with lots pipes and one giant clear cylinder. Exceptionally similar to TMNT-inspired toys and ooze sets. William Fichtner reappears to give a profile shot facing the mask of Shredder! The mask looks GREAT. A close up shot on a clear canister with the letters "TCRI" on the side which could stand for "Techno Global Research Industries" or "Techno Cosmic Research Institute," depending on which way this movie wants to take the science. And inside, beautiful green ooze! Cut to a snow scene. The Turtles are sliding around down a snowy mountain. The scene is fast but it looks like they are using their shells for snowboards. One Turtle yells out "batter up!" 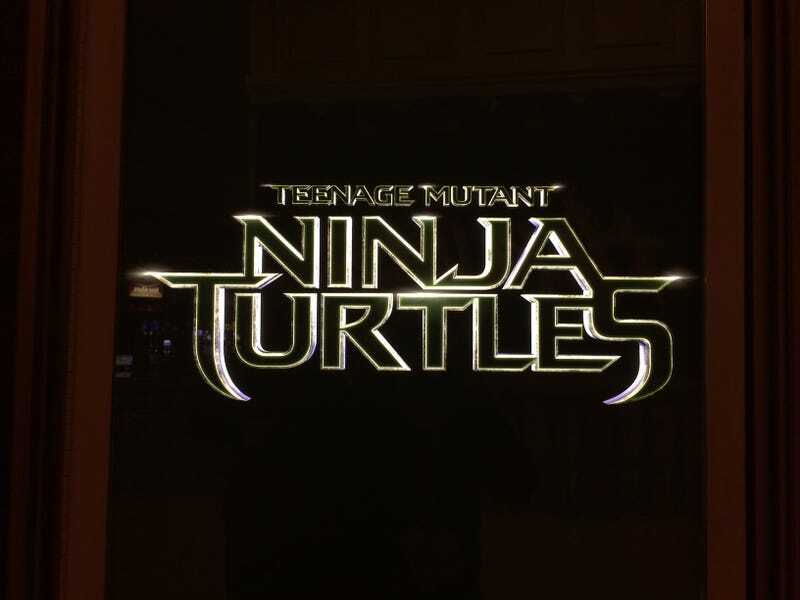 So that's the first evidence that this movie adaptation is trying to capture the childlike innocence of the turtles. No one says cowabunga — which is sad, but I'm guessing that's probably been cut due to it being no longer culturally relevant. One turtle slides out on the mountain, and an Army truck cuts him off. He hits the truck shell first in slow motion and the whole thing just smashes to bits. It's very delightfully Michael Bay, in the best of ways. It looks like the truck kind of tickled the turtle. So April's father created the turtles, which is kind of a silly tie in that's not really that necessary because she's a reporter and thus already invested — but OK, WHATEVER. Shredder, played by Fichtner, is most likely going to be totally awesome. And also the Turtles are funny, and look like babies.